Goodness. This thing can kill from a pure sugar overdose. It's very sweet, and is more of a brief vignette than a story - I can't really say there is a plot here, it's more about...this is cute, and have a drink recipe while you're at it. If you've ever seen My Love Story! !, this is similar in that there is almost a complete absence of real conflict. Many viewers described it as "Wholesome", and I'd have to agree. The couple is endearingly nice to each other. The husband is almost otherworldly in his gentleness. It's...refreshing, and since the episodes are really short, it doesn't get old. I have to give extra props for the drinks featured in the show - several were ones I had never heard of, and many seemed simple enough to make at home. It was a good selection. All in all, it's a nice show! Nothing really happens, but nothing needs to. It's simple, sweet, and makes one forget the evils in the world for a bit. I liked it. This anime is so adorable, that's all you need to know. You need to watch it right now. If you have enough time to read this review, you have enough time to watch it. Why are you still here, go, watch, my child, watch the anime, it is absolutely beautiful. This anime is fun to watch and I wish the episodes were longer or had a second season. I also like how in each episode when they show a type of drink that there will be a recipe/the ingredients listed so that the views can try it out. The husband is calming and patient and the wife is so cute and hardworking. Now this isn't going to be the MOST AMAZING or the MOST CREATIVE....but what it DOES do...it does VERY well. It's a cute, fun, and happy show that shows a healthy and functional relationship. Sure it's kind of samey in some respects, but with each episode being 2.5 minutes long you won't mind. It's a safe Anime where you can watch it to get little bursts of endorphins and let your stress of your day just roll off you. Honestly if you enjoy Cute Anime...there's literally NO reason to NOT give it a shot at only 2.5 minutes an episode! Honestly my only complaint is just that each episode is so short and/or so few episodes! Short, sweet, and doesn't over stay its welcome. LILAC is a collection of warm windows into a cute couple's sentimental daily ritual. She's an office worker and he's a part time bartender, she loves trying new cocktails and he enjoys making them for her, and we get the recipes to try them ourselves complete with ingredient measurements! I'd love to see more of this story but honestly what we are given is more than enough. There's nothing wrong with wanting to tell a tightly written, warm and comforting, and above all cute story. 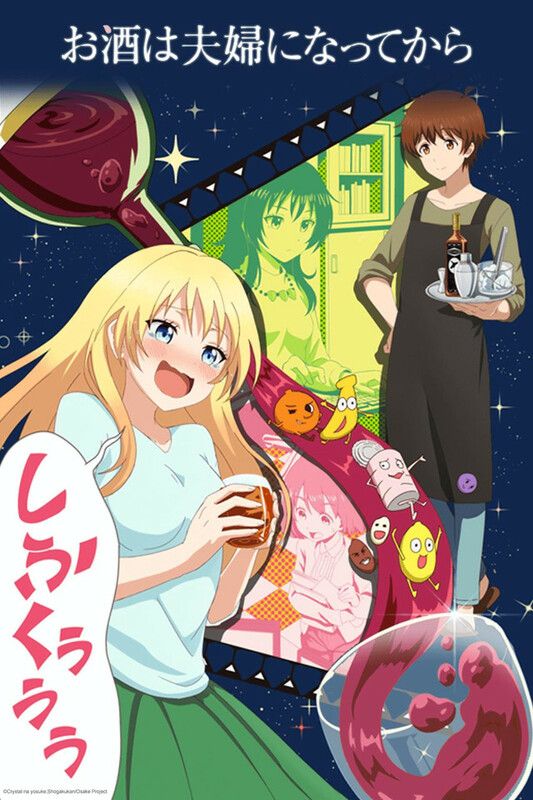 This was a really good anime,It was short but it can make you giggle and have a good time.The wife is really cute when she is drunk.I really enjoyed it even though it was short,and it can teach you recipes for non-alcoholic and alcoholic drinks,I had a fun time watching this show. You see the poster and think it's going to be a waste of time. Maybe you don't even drink alcohol (or not old enough to), but that is besides the point. You should replace the alcohol with something else and the 'story' would remain the same. It's a story about sharing what you love with the person you love. Plus, there are some recipes in there for you to try out yourself if you do like to drink. Cute and straight to the point. Booze makes hardworking wife happy, especially when hubby makes her a new cocktail for her every mood. A lovely short series with a bit of cocktail history in Japan. My hubby usually makes my dinner and buys me craft beer which is good enough for me. Just Not For Me, But Maybe For You Though? **DROPPED AT EPISODE 4** Maybe it's the fact that I'm currently underage and have no fascination or interest in alcohol, but this was pretty boring to be. The main problem for me is the episode length. I feel that it doesn't utilize it well enough and that doesn't give hardly anytime to connect with any of the characters and their traits, outside of what the synopsis tells you about them. Overall, I don't recommend it, but if you're curious then I won't stop you.